A confluence of multifarious musical influences steeped in the Maihar gharana’s dhrupad & beenkar styles, Seshadri began his initial training with Shri Shankar Rao of the Vishnupur gharana and further trained and toured worldwide with his acclaimed guru, Pandit Ravi Shankar. Seshadri performs extensively in his homeland and around the world, including the United States, Canada, Europe, Japan, Australia, Mexico and the Middle East. He has played at prestigious venues and events ranging from Carnegie Hall, the Kennedy Center, Lincoln Center, the Melbourne International Arts Festival in Australia, the Brighton Festival in U.K., the Ravinia Festival, the 2002 Winter Olympics in Salt Lake City to the Dover Lane, ITC, Sawai Gandharva Samaroh and Saptak Sammelans in India to name but a few. In 2005 and 2010, Seshadri collaborated with composer Philip Glass and the Brazilian instrumental group UAKTI on the critically acclaimed Orion project. In 2016, he was specially invited to perform before His Holiness, the 14th Dalai Lama. Seshadri has received numerous awards and accolades for his contributions to the musical world including his nomination as the “Artist of the Month” by the prestigious Sangeeth Research Academy (SRA) in Kolkata (June 2011) and his 2014 honorary award from the Federation of Indian Associations (FIA) for his “incredible contributions, vision, leadership and expertise in the creative field … and as a true pioneer” of music and art. Seshadri is also a distinguished composer and educator of Indian Classical Music. His Quartet for a Raga was premiered under the auspices of the Contemporary Music Forum in Washington D.C. And his “Concerto #1 for Sitar and Chamber Orchestra” received its world premiere in San Diego in 2010. 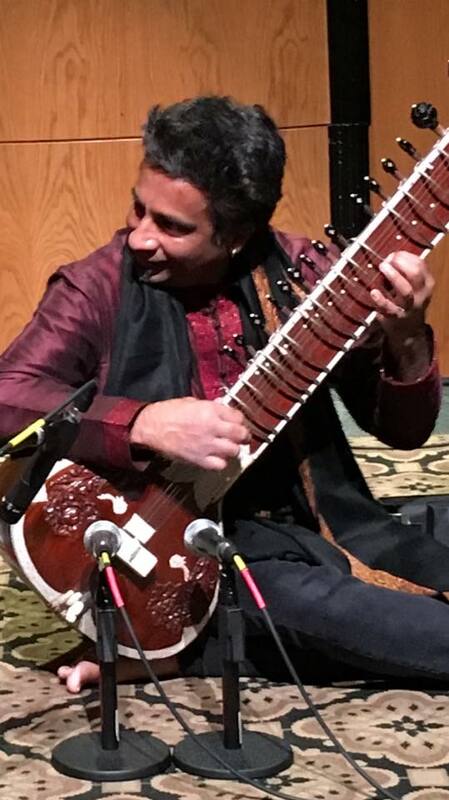 As an educator, Kartik Seshadri heads one of the largest programs of Indian Classical Music in the US at the University of California, San Diego. He has been invited as a distinguished guest faculty member at various conservatories, universities and academies around the world including The Banff Centre in Alberta in Canada, Stanford University, the Yehudi Menuhin School of Music in Bath, U.K., and the Sangeeth Research Academy (SRA) in Kolkata, India. In 2009 Seshadri launched Raga : Rasa – Kartik Seshadri’s Center for Indian Classical music and improvisation.